One of my favorite garden accessories is my bird bath. Of course, this old thing has been with me for years and sometimes I think that maybe I need to buy a new one. Or, DIY a new one. 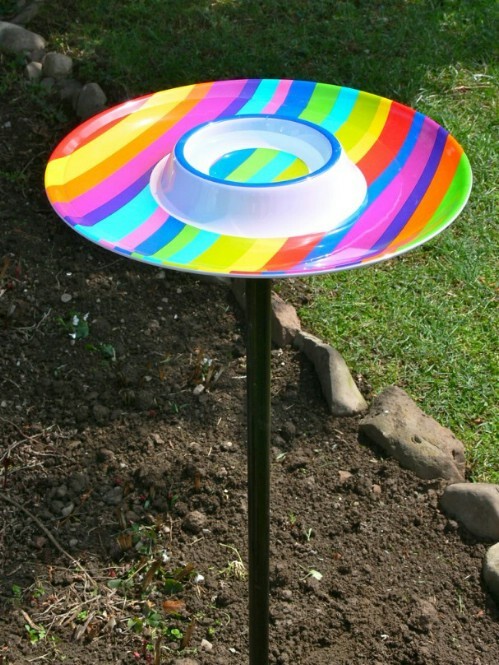 I recently began thinking about ways to add bird baths to my yard without spending upwards of $100 for each one. 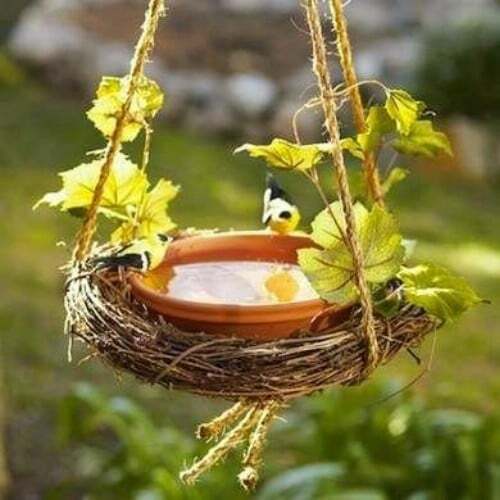 What I found are 20 adorably easy DIY bird baths that you can build in a day – or less in most cases – and add to your garden. Your feathered friends are going to love these bird baths as much as you do! I do love spending time in my garden and that includes my veggie and flower gardens. For me, the perfect afternoon is working outside to decorate my yard and garden and these DIY bird baths are going to help me to do that. I can’t wait to get started on some of these and I hope that you are as excited as I am about them. 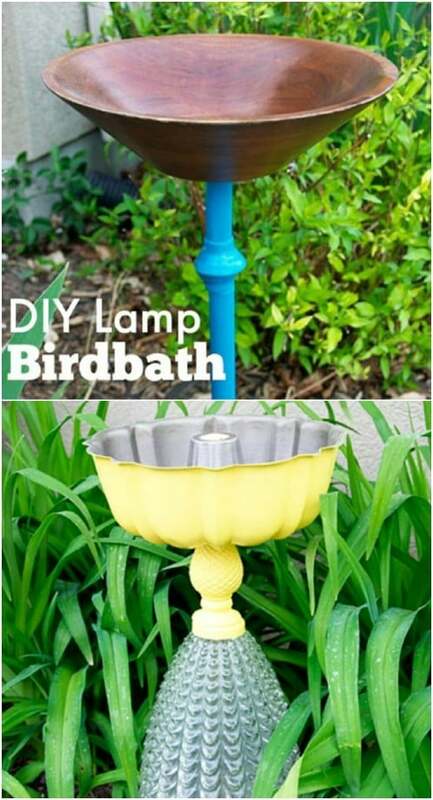 From decorative and whimsical bird baths to really easy ones that you can put together in about 15 minutes, you are sure to find a DIY bird bath that you simply must add to your garden. And, you want to take a look at these 25 DIY garden markers to add some beauty to your outdoors, too. A bird bath is a decorative yet functional piece that every yard should have. You always want to give your birds a place to refresh themselves and let’s face it, bird baths are just gorgeous, especially when you make them yourself. From terra cotta pots to upcycled teacups, you are going to find that these are simple to make and use so many recycled materials. Many of them won’t cost you anything to build. How is that for being frugal? Be sure that you also check out these 30 DIY lawn decorations that add whimsical style to your yard. They will go beautifully with your new DIY bird bath! 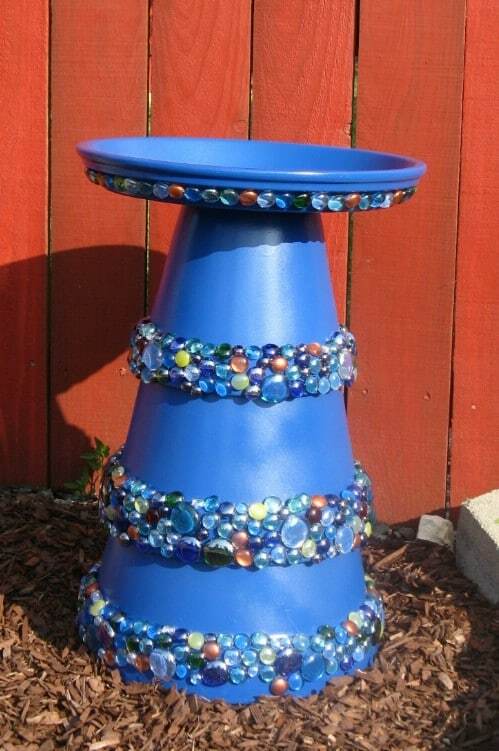 This topsy turvy colorful planter/bird bath is perfect if you are a fan of Alice in Wonderland. 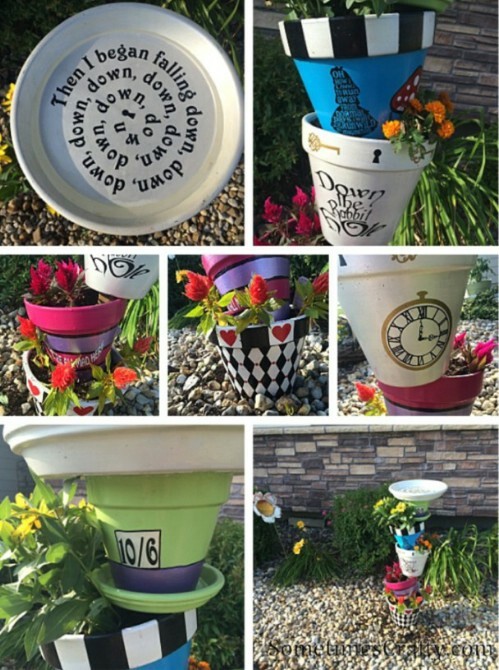 It’s really simple to DIY and it adds to much whimsical style to your garden. You can make this with terra cotta pots – which you can pick up at the Dollar Store for just a few dollars each and then just add the colorful paint and put them all together in this adorable style. A really inexpensive plastic chip and dip platter can easily be turned into an adorable bird bath with just a little bit of work. You can find these chip platters at the Dollar Tree for just a dollar each. Then you just have to attach them to a pedestal of sorts and put them in your garden. Chip platters come in all sorts of different designs and colors, too so you can really decorate in any style that you want. There are some really amazing DIY concrete projects that you can do to add style to your garden. This concrete leaf bird bath is one of them. You make this completely from scratch and it’s so inexpensive. Bags of concrete really don’t cost that much and this one is really simple. It’s also gorgeous when it’s finished and perfect for adding some DIY décor to the garden. You don’t have to build a bird bath with several terra cotta pots to get that same look. You can take a rather large pot and use it to create a stunning bird bath – with or without painting or otherwise decorating it. This is one of the easiest DIY bird baths that I have seen and it’s one that you can have set up in under an hour. If you want something super cheap and simple, this is definitely one to look into. 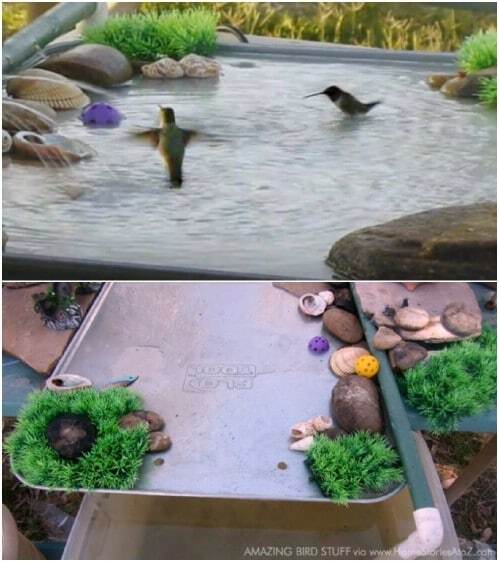 This bird bath can actually be built without spending any money. You make this one from sticks that you can pick up from your yard and then you just have to add something to act as a water basin. Any old dish or bowl will work. If you want a bird bath that you don’t have to spend money on, this is it. It’s easy to make and if you have an old dish to use, it won’t cost you anything to build. I love DIY mosaic projects and this one is really gorgeous. 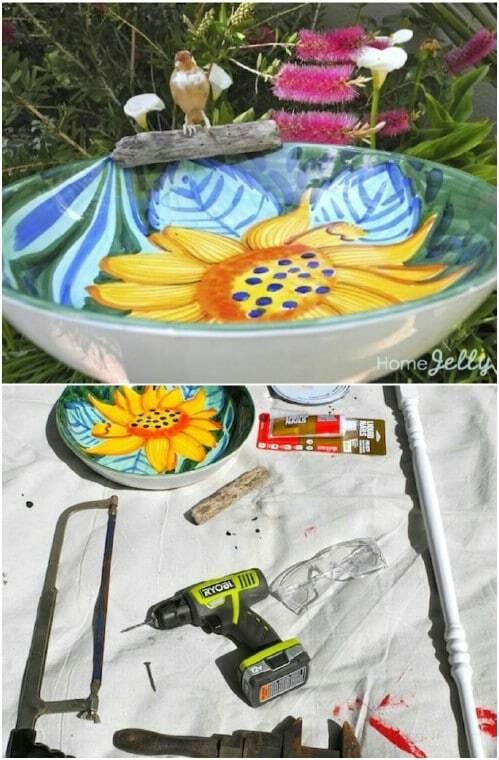 You can turn a normal terra cotta pot and some broken glass into a beautiful new bird bath. Your little feathered friends will really appreciate the design of this one – and you will, too of course. It’s not a difficult project although it will take you a bit of time since you’re doing mosaics. When you’re finished though, you will be really glad that you put that extra time in. Your bird bath doesn’t necessarily have to sit in the garden. It can hang, too. 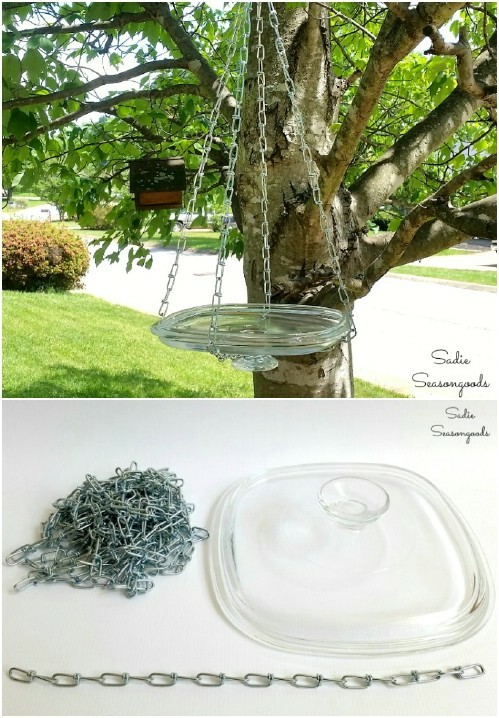 This one is made from an upcycled glass lid and hangs from a tree and it is so easy to DIY. 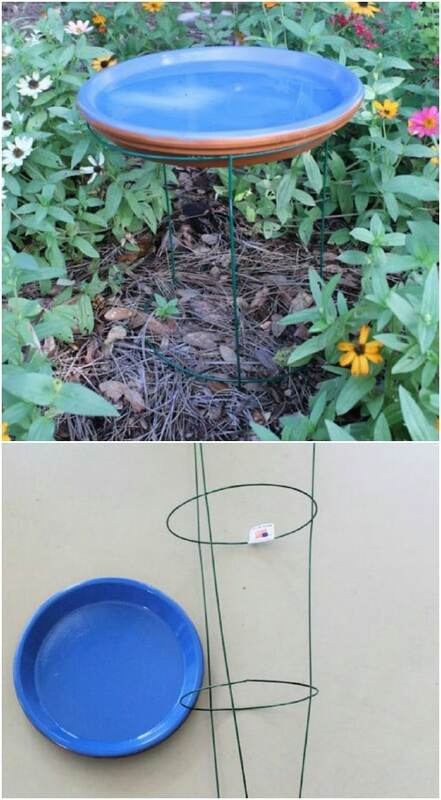 You can use any lid that is deep enough to hold a bit of water and then just grab some rope or small chains to make the hanger. The lid sits right into the hanger and your birds will love having their bath near their nests. 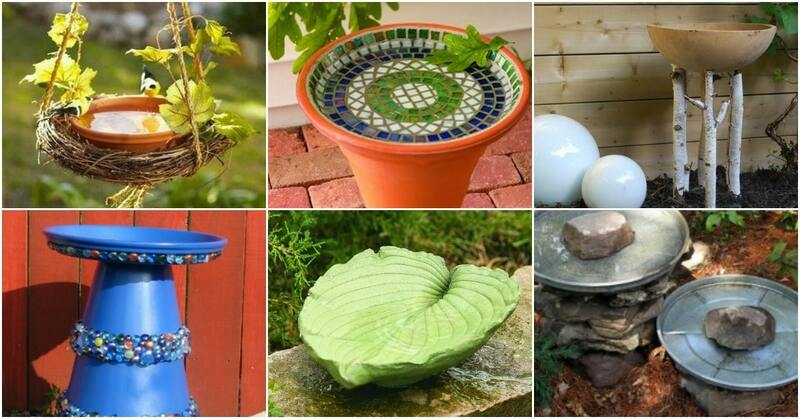 You can build a bird bath out of just about anything, provided it gives you space for water. I love this one that is made from repurposing some old glass dishes. You can use vases for the pedestal – and I love the idea of filling the pedestal with burlap. I always love DIY burlap projects. Then you just need something for the top to hold the water and you’re all done. When you make a bird bath, you have to have a pedestal, right? 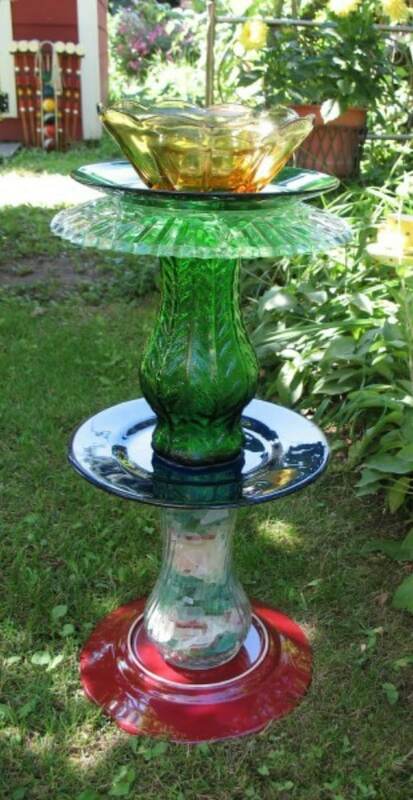 You can turn an old lamp base into a gorgeous pedestal for your bird bath. 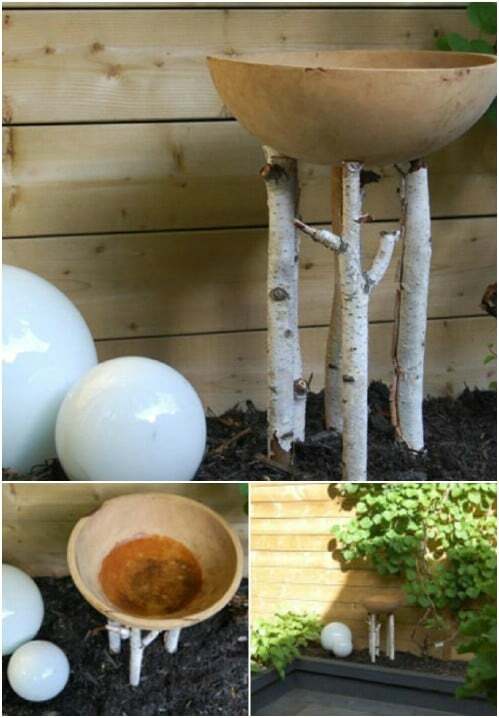 Just attach a wooden or glass bowl to the top and you have an easy to build and really cheap to make DIY bird bath. You can find old lamp bases at any thrift store for just a dollar or so each if you don’t have one on hand that you can use for this one. You can get a rather large oil pan at any automotive store for just a few dollars and then turn it into a gorgeous and rather large bird bath. You can decorate the pan however you want. 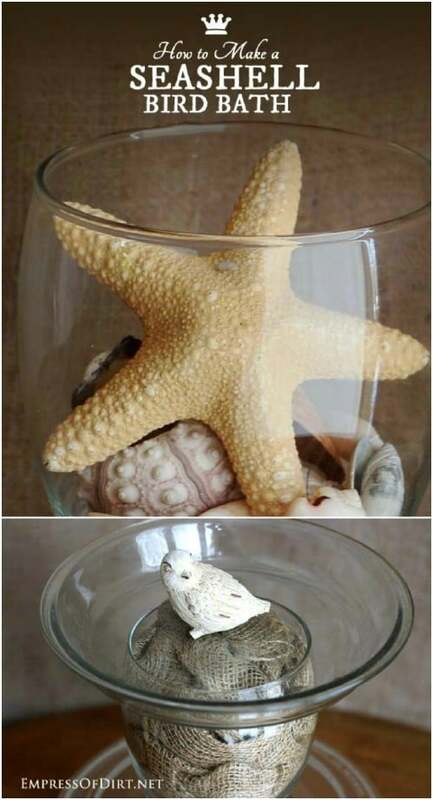 Add some stones and other décor or just paint it and leave it without additional decorations. This is a great one if you have quite a few birds around your house. They will all have room to bath at the same time! 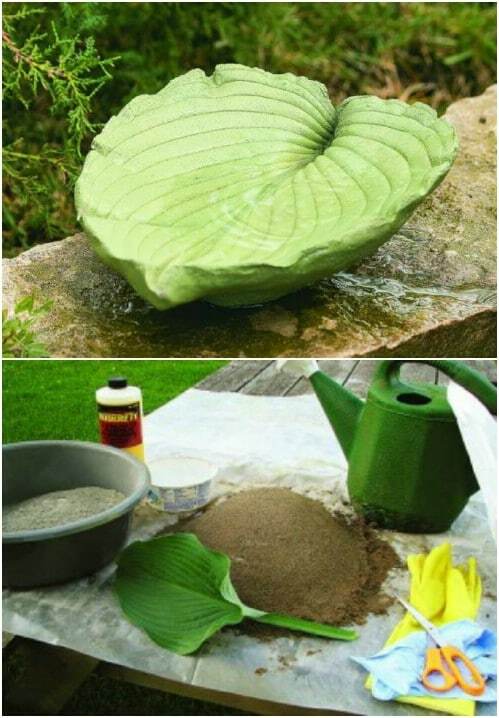 This is a really simple DIY bird bath to create and it won’t take you longer than an hour or so to finish it. You simply stack your terra cotta pots upside down, and they will need to range in size from large to small. 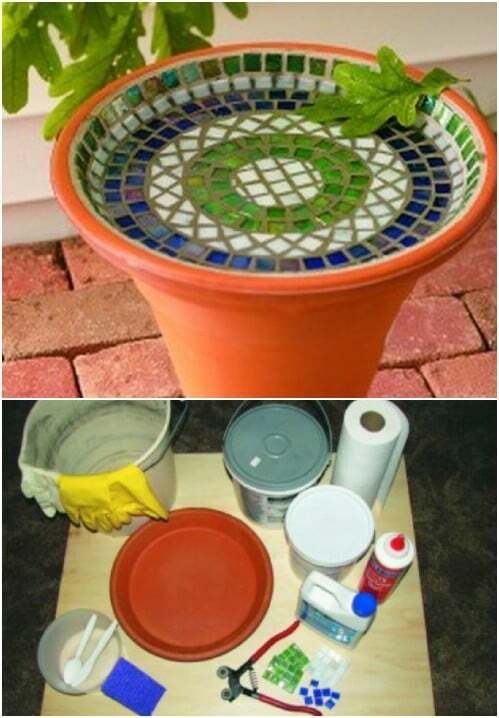 Glue them all together and then use a terra cotta pan to create the water basin. Then, paint your pots and add decorative glass stones, beads and other embellishments to give it this great look for the garden. I really do love the idea of using furniture in the garden. 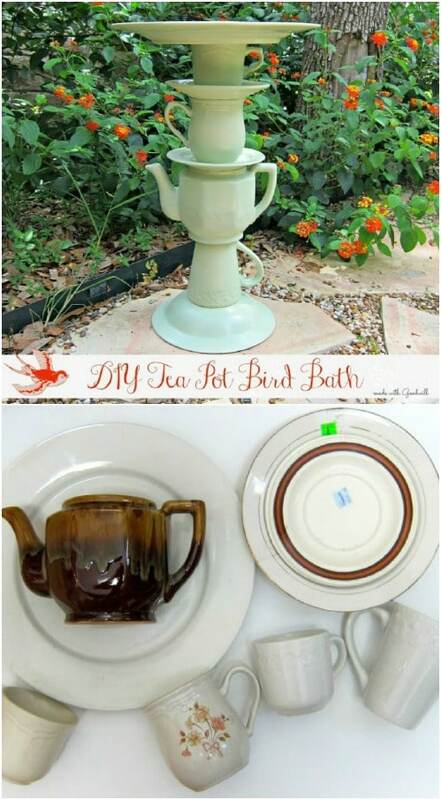 This upcycled chair bird bath is another great idea to reuse that old furniture and turn it into something new and exciting. You can use a metal or wooden chair for this one – whatever you have on hand. I think the wrought iron chair is gorgeous and makes such a lovely DIY bird bath. You just have to add something that will hold the water. You can buy a glass serving bowl for less than $5 at thrift stores or check your local Dollar Store. Then when you get it home, make it into the perfect DIY bird bath. This is one of the easiest ways to get your own bird bath and it won’t take you longer than an hour to complete. You could do a few of these in different sizes and really dress up your garden. If you want something rustic that is going to pair well with your outdoor farmhouse décor, these stacked stone bird baths are perfect. You can gather rocks from the yard or check with your local contractors to see if they have any that they are willing to give you. Then you just stack them up and add a water basin and you have a rustic and lovely bird bath for your little feathered friends. Turn those old teacups into a beautiful and functional decoration for your garden. You just stack the teacups up and add a dish for the water basin. This is a lovely idea for adding a bit of old world charm and design to your garden area and you can customize it to match your outdoor décor by painting the teacups. This is one of my favorite ways to upcycle old teacups. 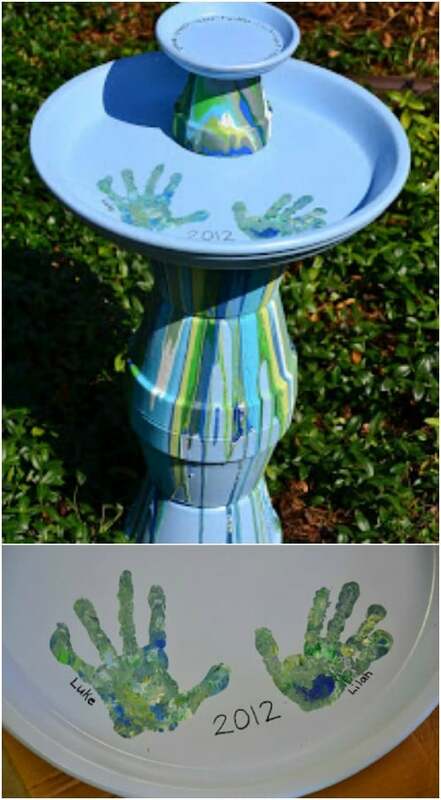 Get the kids involved in your DIY bird bath making with this lovely handprint bird bath. This is a great way to preserve the memories of your little ones while they are little and you get an amazing bird bath out of it, too. And, kids love handprint projects and you could do one for each of your little ones and have bird baths all over your garden – depending on how many little ones you have. This would also make an awesome gift for grandparents. That old sink that you plan to replace in your bathroom can be turned into a lovely bird bath. 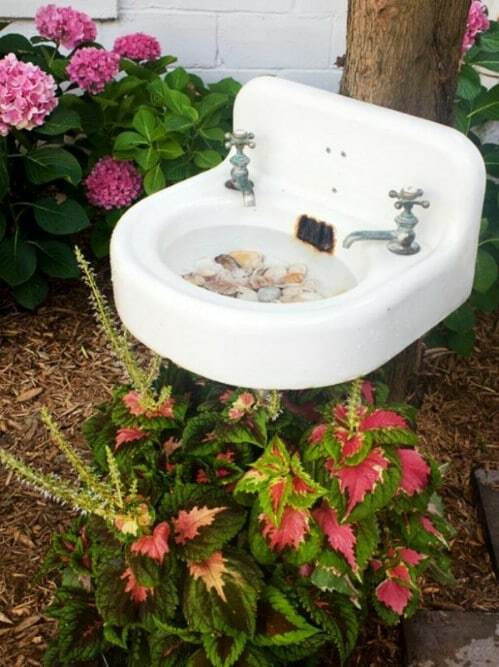 This is such a whimsical look and it is the perfect way to reuse that sink that you might otherwise just throw out. You just have to put it on some sort of pedestal and then add a stopper so your water doesn’t run down the drain. What a wonderful way to turn trash into treasure! Now is the perfect time to start buying tomato cages for your garden. And, be sure to get an extra one or two to use as a base for your new DIY bird bath. I love this idea. It is so easy and will literally only take you about 10 minutes to complete. You just use the cage as the pedestal for your bird bath and the top is perfect for adding a large dish or other container to act as the water basin. If you have a few old dishes that you don’t use any longer, you can turn them into a gorgeous glass bird bath. 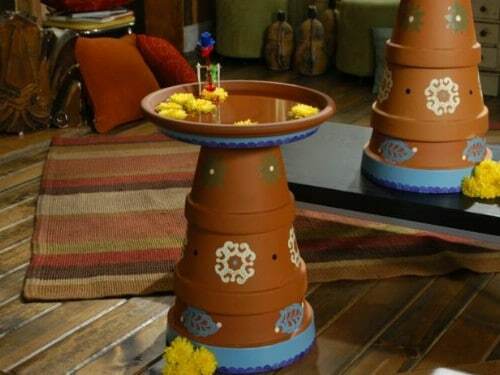 Use the plates to add dimension and design to the bird bath and for the basin and you can use vases to create the pedestal that the bird bath rests on. This is so easy and it is a great way for you to repurpose those old glass plates. You can buy a grapevine wreath or make one yourself and then use it to hang your bird bath from a tree in your yard or garden. The bird bath itself can be anything that will hold water such as an old plate or a terra cotta plate that comes with your planters. Use a DIY decorative plate to give it even more style. Just make sure that your wreath is the right size to hold your water basin. This one is so easy that you will likely want to have a few of them hanging from the trees in your yard.